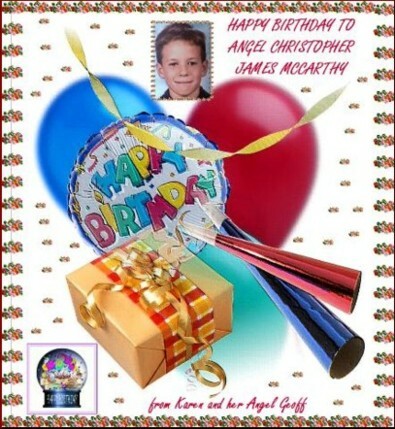 Chris was born in June of 1980, on Jim's birthday, as a matter of fact, Flag day! Ryan was 18 months old when Chris arrived. I almost lost Chris twice while pregnant with him. At 10 weeks I began bleeding, that lasted for 3 weeks. That resolved, THEN I had an appendectomy while pregnant with him! So when he was born healthy, I was elated. I had been concerned, with all that had happened while pregnant with him, but he WAS perfect. 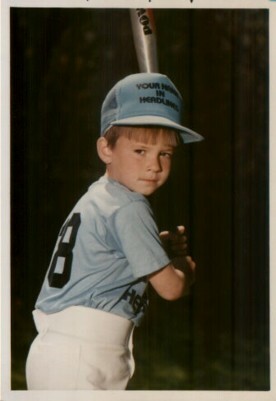 When Chris was 18 months old, we had another close call. We were visiting down in Texas, on our trip home, we drove, about 2 hours into the 30 hour drive, Chris got sick, and stayed that way for the whole trip home, vomiting, diarrhea, high temp, the works. When we got home I took him to the doctor, he was VERY sick! He was immediately admitted to the hospital...he had salmonella, came so close to dying, he was so dehydrated. Spent 10 days in the hospital. 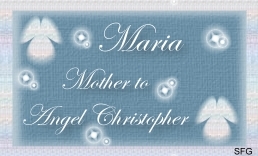 These are three beautiful and loving gifts for Angel Christopher from my dear friend, Carol, mom to Angel Michael. 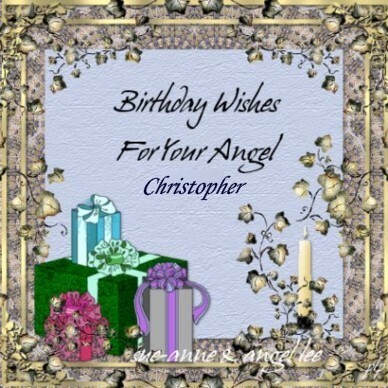 These four special gifts for Angel Christopher are from my friend Marie. 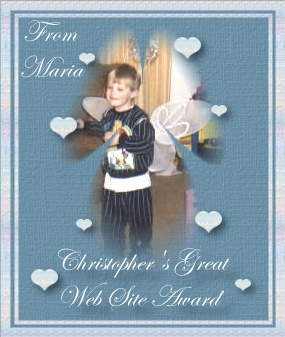 This is a loving gift to Christopher from Sheila, Mom to Angel Carliser. 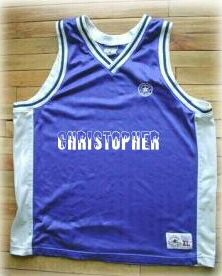 I used to go and watch all of Chris's practices; I couldn't get enough of watching him play. 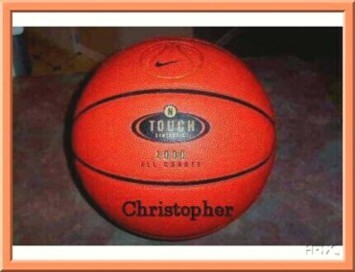 About a month before Chris died, I sat at a practice, taking in his skillful play and thought, "This is what life's all about". And on the way home, I told him how happy he made me. About two weeks before his death I had a conversation with him. I asked if he felt as if he was missing out on too much because of his commitment to soccer. 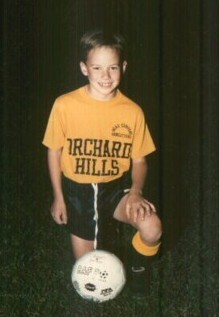 He often had to miss dances or birthday parties, because of soccer. 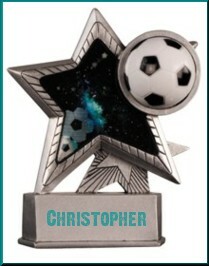 He was playing on two teams at the time, and on his off days he assisted me in coaching Kyle's soccer team. So it was soccer 7 days a week for him! He told me that he was happiest on the soccer field, and that he was doing what made him happy. I'm so glad now that I had that conversation with him. On the day of Chris's accident, I had made a trip to NYC. My brother Mark was in the city for a buyer's convention. 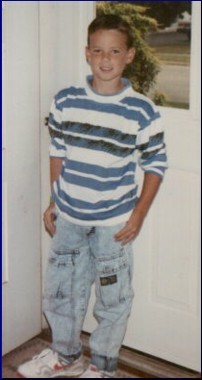 Mark was living in San Antonio at the time. He was a toys and health and beauty aids buyer for K-Mart or somewhere like that. My brother Dan was stationed at West Point at the time, and Dan's in-laws live here locally. So Dan's family was visiting with his in-laws for the weekend. Mark came here the night before and in the morning, Dan met us here, and we all took a train into New York. The convention was a BIG BORE. Dan and I were anxious to be done with it! Of course we probably shared that with Mark as well. So Dan and I finally bid our adieus to Mark. As we headed for the train station, we decided to stop and get something to eat, oh how I wish we had just gone straight to the train station. That hour may have saved Chris's life! 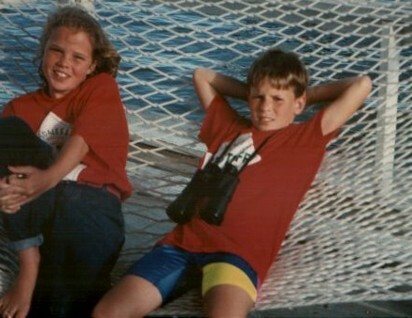 It was strange, the whole way home; I talked to Dan about Chris, not the other boys, just focused on Chris. Which was unusual, as I usually bored my captive audiences with news of all my boys! Dan's car was at the train station, so Dan was just going to drop me and run, his wife had expected him earlier than we were actually returning home. Well when we pulled up in front of my home, there were about 3 police cars in the area, none of them actually in front of my home. But it was rather curious. As I was getting out of the car, thankfully Dan had not pulled away yet, I noticed through my window, there were some police officers in my home. I suddenly felt TERROR! I asked Dan to come in with me. 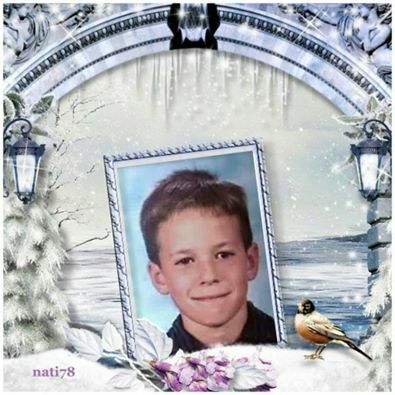 As I entered my home, the police stopped me, asked if I had a 12-year-old son, which I replied yes to, Ryan was 12, Chris was only 11. They said that there had been an accident. I asked how bad it was and they said they didn't know, that my son had been taken to Yale New Haven Hospital. We were having our house remodeled, almost gutting the house, a $90,000 job. The contractor had, the week before, placed about 15 sheets of extra long sheetrock, leaning against the hall wall, he had it all clamped together for safety reasons. The sheetrock had somehow fallen to the other side of the hall, and pinned Chris at the throat. Jim had left Chris home reading a book for school, while he went to drop off an article he had written about Chris's team. 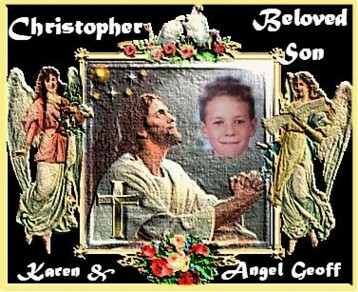 He was gone with Kyle for about 40 minutes, when he returned home, he found Chris pinned by the Sheetrock, pulseless and without respirations. My poor 7 year old Kyle made this discovery with him. As I rounded the corner, I saw police tape going across the hall; I went to the area, but was told by the officers, that I couldn't go near there. They told me that my other children were down the street at a neighbor's house, and that Jim had gone to the hospital with my son. Now mind you, I am thinking that this is Ryan who was injured. He was a bit accident prone, so it all seemed to fit! Well the police were giving us directions to the hospital when the phone rang, it was Jim! He told me that he had no pulses, that he had to do CPR, I was losing it quick, and the weird thing was that Jim never mentioned Chris's name either. He said that they were working on him in the ER, and that he didn't know much about what was happening. I hung up from Jim, continued to get directions from the police to the hospital. And just then Ryan arrived! I saw him and almost passed out, I had a moment of elation, I thought, you stupid people, it WASN'T my son, and here he is safe! Well the elation lasted for just a moment, when I realized that Oh my GOD it's Chris. 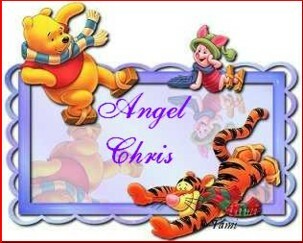 Chris always seemed more fragile to me. I know it's silly but when I thought it was Ryan, I had thought, Ryan is a tough guy, he can handle anything! But Chris was a different story. As we traveled to the hospital, I knew in my heart that Chris had little hope of survival, I kept hearing Jim's words to me��. "I had to do CPR on him." Being a medical professional, I realize that when a heart stops, the chances of the person surviving that insult to the brain is slim. Dan tried feverishly to calm me, to help me to think positive. I could not stop shaking. 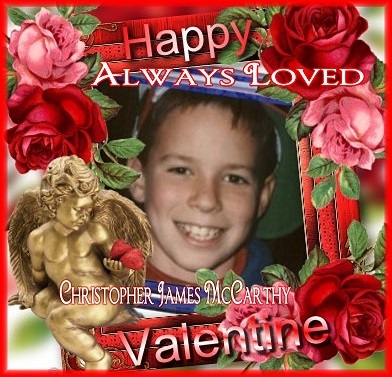 We pulled into the driveway of the emergency room, I remember wishing that Chris had not been taken to Yale, but instead the hospital where I worked, thinking that they would try harder to save his life. Dan dropped me off and went to park. As I entered the emergency room I immediately saw a Milford police officer. I knew that he must be here because of Chris. I identified myself, and asked how Chris was. He was very uneasy with me, and said he didn't know Chris's condition, that they were still "working" on him. He asked me to follow him, and he would lead me to my husband. I can't describe the overwhelming feeling of dread as he lead me to a room that I know well, a room that is known in the hospital as the "bereavement room". I knew just what being in this room meant. As I entered, I was hit by even more assurance that this was serious, as I found a priest present in this small room with my husband. The priest began to utter his sympathies to me, and I stopped him cold, I would not allow his words, I thought if I did not allow him to speak them, then possibly, what he had to say, could not be true. I politely asked him if I could be alone with my husband, and he seemed to be relieved to be excused from this horrible task that he had been sent to do. Jim was in shock, we embraced for a moment, neither of us able to speak. We embraced and shook, that is all we were capable of. 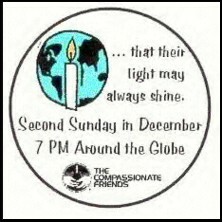 Within a few moments a very close friend of mine Gail, entered the room. She was a nurse who worked in Pedi ICU at Yale. I was so happy to see her. She had just come from the room in which they were working on Chris. She was brutally honest with me, which I appreciated. She told me that they were still performing CPR on him, that they had opened his chest to do internal heart massage. I too know, that this is a last ditch effort. I asked her to please implore them to continue. She assured me that they were doing just that, that everyone involved in Chris's resuscitation efforts were 100% committed to saving his life. I asked her to return to the room, and be there with Chris for me. I wanted him to have someone who loved him, there with him in case he did not survive. It seemed like an eternity, but eventually Gail returned to tell me that they had gotten Chris's heart started. Jim was so relieved, however I knew that being pulseless for over an hour, was something that few can survive. 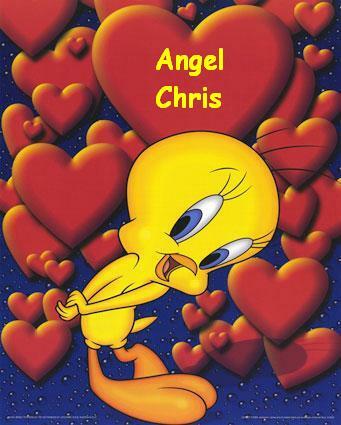 She then explained that they had to take Chris to the operating room to fix a hole in his heart. This was either from the accident, or from CPR or from opening his chest, but in any event they had to repair that as well as close his chest. I told her I needed to see him before he went to the operating room. They allowed us to stand in the hall and quickly utter our "I love you's" as they ran by on the way to surgery. It was then we realized that we had phone calls to make. Gail took us to the waiting area for the OR. She stayed with us, so as to be a liaison between us ant the hospital staff. 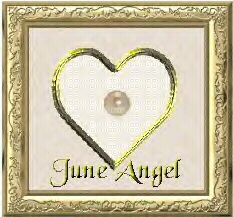 She was my angel. Helping me to remember #'s, helping me to make phone calls. Your mind shuts down during times such as this, and you are unable to perform even the simplest of tasks. I called my mom first, she lives in SC, I knew that Chris needed lots of prayers, and she was the was the best pray-er that I knew. I told her that he was serious but that I was remaining hopeful. We called Jim's mom as well, and she vowed to pray for him as well. I don't remember who else we called at that time. I just remember that my mother's words soothed my soul. As we sat waiting for news from the surgeon, the contractor and his partner arrived at the hospital. I'm not sure how they had found out about the accident. 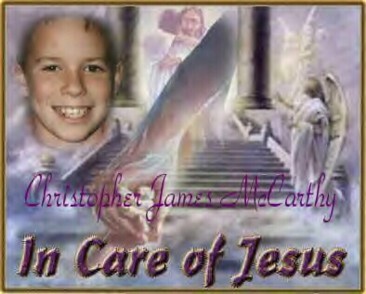 We all hoped and prayed for the best for Chris. Soon the surgeon emerged from the OR suite. He explained that Chris had survived the surgery, but we had to wait to see how the anoxic event had affected him. He then told me that he was making urine, I had my first glimmer of hope, for I knew that meant his kidneys were still functional, and I was hopeful that the rest of his organs were as well. We kissed him once more, and were told to meet them up in Pedi ICU. It seemed like an eternity, once again, as they settled him into the bed. When he was settled, we were then allowed time at his bedside. My child looked so fragile. I had seen many people hooked up to all this equipment before, but nothing could prepare me for the sight of my helpless son, unable to even breathe on his own. There was an incredible peacefulness about him as well. There were no apparent injuries on him as a result of the accident. He had a dressing on his chest, where they had opened it, and subsequently closed it, and he was wearing a cervical collar, because of the possibility of neck injury, but beyond that, it appeared as if he was sleeping. His arms and legs, his face and abdomen, dispelled nothing about the graveness of his injuries. Jim and I, each taking a side of the bed and a hand, pleaded with Chris to be strong, to pull through this. 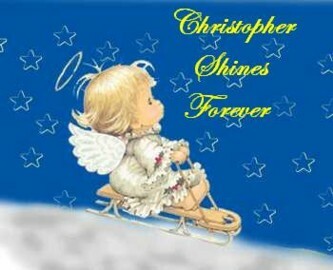 I remember uttering probably hundreds, if not thousands of times, over and over.."Be strong Chris, be strong baby". 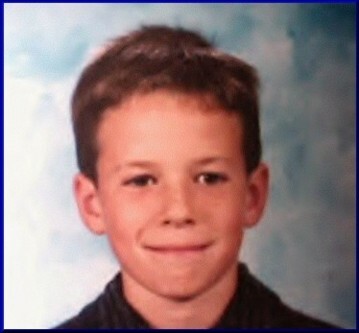 11 year old child to die? I remember in the morning calling my very best friend Beverly, I found it so difficult to tell her on the phone, I wanted her by my side to collapse in her arms. She told me that it had been on the radio every hour since the accident and it then became clear that this was a newsworthy event. Some of the reports were less than kind, leaning towards blame of Jim and I since Chris had been left home alone. Most reports stated that he had been buried under 1200-1500 lbs. of sheetrock, giving the impression of a horribly mangled body. 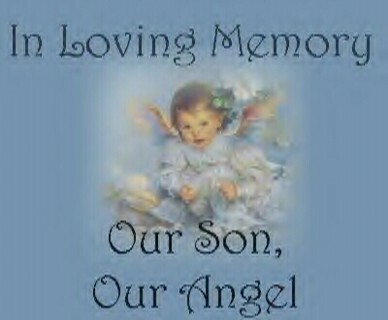 With the morning sun's arrival there were realizations that our son would leave this earth today. That today our lives would change forever. Jim and I attempted to have something to eat, but were unable to swallow any food, so we settled on coffee. We had no car at the hospital. Jim had come in the ambulance and I came with Dan, who went home at about 2 AM. Soon many people, family and friends began to arrive. Again the hospital was very gracious and accommodating. There were more people there than was allowed by hospital policy but they seemed to recognize the importance of all who were there, for Jim and I, and for Chris, and for themselves. 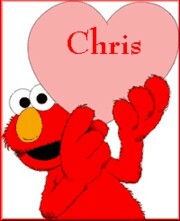 The nurses seemed to be able to determine and feel just how special Chris was, even in his condition. It appeared to me that they all loved him. Eventually just as I expected, the transplant team showed up. I didn't waste any time telling them that, if Chris were to not survive that I wanted his organs to be donated. They began working him up. This is a very involved process, lasting for many hours for the preliminary assessment. And many more if they determine that the organs are viable, following the initial assessment. 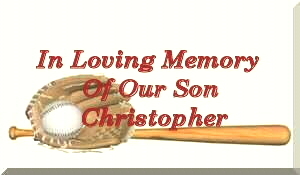 I was so saddened to hear that most of Chris's organs would not be candidates for transplants. Chris's blood pressure was dropping critically low, and requiring medications at their highest dosages to keep it at a level needed to minimally sustain life. This however made it impossible to take his organs as they were not perfused well enough with such a low blood pressure, and on such high medications. The only thing that they would be able to take were his corneas, and they would be able to take those after his death. With the donation of the bigger organs, such as the heart, the lungs and the liver, etc, the person has to be kept alive until they are removed, which means you have to say goodbye, and they die in the OR without you. 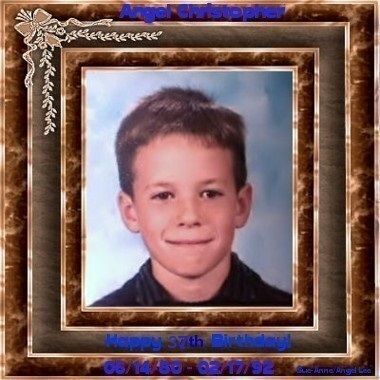 I was saddened by the fact that they couldn't use his organs but relieved at the idea that if Chris had to die, I could be with him at that moment of transition. We returned to the hospital, there were 20 - 30 people there for us and Chris, camped all around the door if the ICU. While I was gone, a priest, a friend of my husband's sister Mary had come, perhaps it was a few priests. 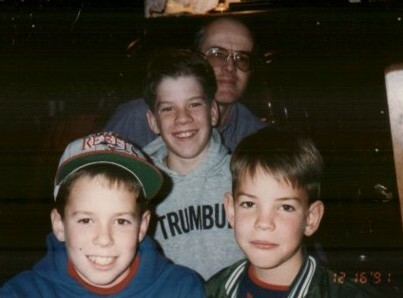 Jim explained to me that they prayed and chanted over Chris, and he was so hoping for a miracle. 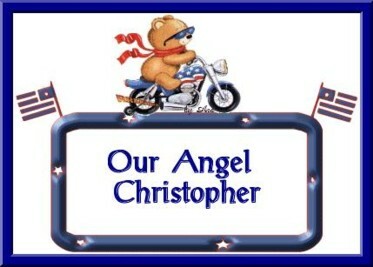 They pinned some very special medals to Chris's pillow and blessed him and left. My parents had called and told us that they were flying up from South Carolina, and would get to the hospital at about 11 PM. Chris was failing. 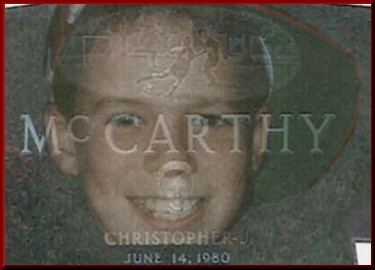 The doctor's wanted to take Chris to CT Scan to confirm his brain injuries, from the lack of oxygen, but they were not sure he would survive the trip to CT scan. 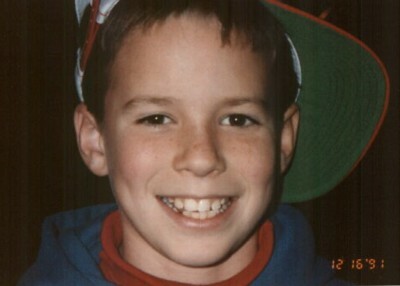 I wanted Chris to be alive when my parents came. The social worker asked if I would like to have my other children come to see their brother. I said yes. I called them, I spoke to Kyle first. 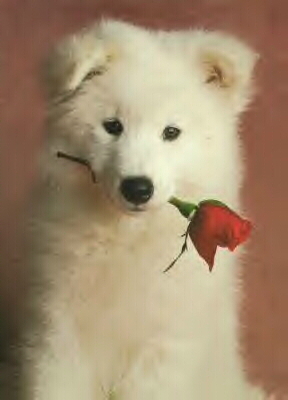 I asked him if he would like to come and say goodbye to his brother. He asked where he was going. I told him that he was going to heaven. He said no, that he was afraid, so I asked him to just come to the hospital, because I needed to see him. The doctors performed a few tests to determine Chris's brain function. All of the tests indicated brain death. We told the Doctor's that we didn't wish any heroic efforts in the event of Chris's heart stopping. That was a very difficult decision, Jim deferred that decision to me, again because of my medical knowledge. We decided that we would remove Chris from the ventilator, but I didn't want to do that until my parents had a chance to see him. The rest of that day seemed to move with varying speeds. There were so many people coming and going with well wishes for Chris. I was somewhat dreading the arrival of Ryan and Kyle. How could I allow them to have to experience the horror of seeing their brother, lying there lifeless. How would I ease this pain for them. This is not one of those things they teach you how to do in parenting classes. Soon that moment was upon me. They were so frightened when they arrived. I needed to be strong for them, I knew that. Thankfully there were trained professionals there to help me with this difficult task. A social worker took the four of us into the room which they had provided for us. Jim and I sat holding them as the social worker described just what they would see when they went in. She described the surroundings, the machines, and explained what they were for. She told them that we would all be with them, and then asked if they would like to see him, putting no pressure on them one way or another. They both bravely said that they wanted to see Chris. As we emerged from the room, I remember seeing all our friends and family, they were so sad. All seemed to lower their glances knowing that no words could take away our pain. We went in to the ICU. Kyle was holding onto my hand for dear life. 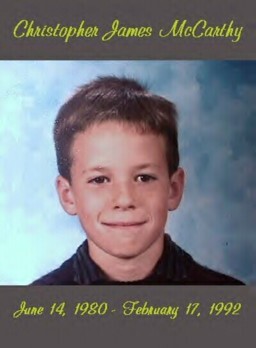 He was only 7 years old. He had no life's experiences to prepare him for this but he was so brave. Ryan seemed numb. He was 12 years old, and that is a difficult time for a child. It is difficult for them to show their emotions. They are nearing that age in which they must act like men. He didn't know quite what to do. Jim and Ryan took one side of the bed, and Kyle and I took the other. The social worker stood quietly behind, out of the way, but close enough in case she was needed. They both stood quietly for a moment, I encouraged them to take Chris's hands, telling them that perhaps Chris would be able to somehow feel their presence. When they finally touched Chris, it seemed to relax them a bit. It was all I could do to keep from collapsing, experiencing the gut wrenching pain of watching my sweet children embarking on this bitter task of saying goodbye to their brother. I told them to talk to Chris, that somehow, someway he would hear the words. It was so difficult for them to know what to say. Kyle spoke softly. 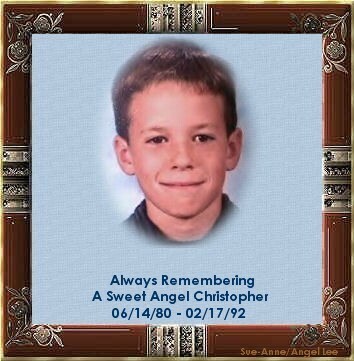 His words to Chris still rock my inner being to this day, he simply said "good-bye my Buddy" and then began to weep, ever so softly, holding tight to his big brother's hand. 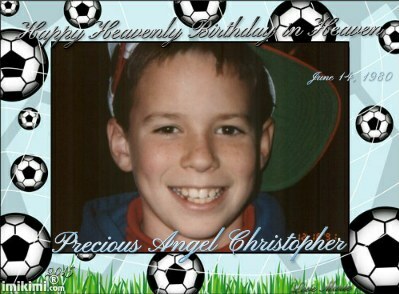 Chris was his hero, and now he had to say good bye. I took Kyle out of the room, told him that Chris loved him, and that I was so proud of him being brave enough to come and say goodbye to Chris. We sat alone in the room and cried just a bit. I knew that they needed to be gone from this very sad place, so I asked my brother in law if he would take them back home. The next task was now at hand. Chris's best friend had arrived. His best friend was Kristin, she lived up the street from us and they had been friends most of his short life. Who knows what will be good for children in cases like these, but again, the social worker stepped in. Kristen's parents felt strongly that she needed to see Chris. The social worker once again explained what was ahead of her, and in we went with Kristin. She was there for a few moments when she became ill. The social worker was on the sight in a moment, holding Kristin up as she vomited into the wastebasket by the side of his bed. She then said her good-bye's and left. It was painful for her, but something that she is so thankful, to this day, for having experienced. As the day progressed Chris was failing, I needed him to stay alive until my parents arrived. And that was still hours away. 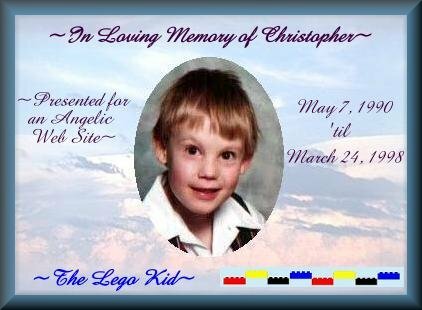 The doctors again talked about taking Chris to CT scan, fearing that he would not survive the trip to the Radiology department. I pleaded with them to not take him. They explained that if we were going to take him off the ventilator, that there may be a time later on in which I questioned if I had done the right thing. The CT scan would tell us unquestionably, the extent of brain damage that had been done. Assuring us that our decision was warranted. 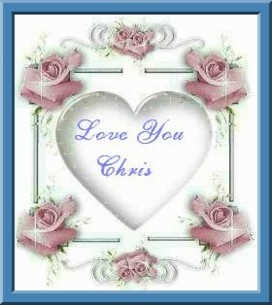 As they prepared Chris for the CT scan, I prayed with everything I had, that he would make it back to me. There was no question in my mind anymore as to whether or not he would die, now the only question was when. I remember having a few private conversations with friends and family that afternoon. I would bring them in one at a time to talk about taking Chris off the ventilator. I needed to hear it from everyone that it was what we needed to do. 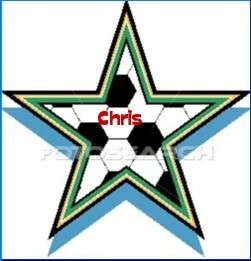 And one by one, all agreed that was what we needed to do for Chris. One conversation stands out above all. That was a conversation that I had with my friend Beverly. She held my hand, she cried with me. She told me she loved me, she told me she loved Chris. She told me that it was my great love for this beautiful child that would guide my decisions, that to feel his love and I would know what to do. It was then that I was sure of what we needed to do. 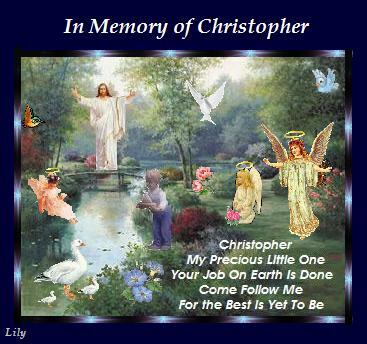 I wanted to help guide Chris to his resting place. I needed to hold him as this transition occurred. Chris made it to and from CT scan uneventfully. I was so relieved. There were a lot of people there and at times Jim and I felt as if we were the hosts. We had to make sure that everyone felt as if they had gotten equal visiting time at Chris's bedside, as we mingled through the friends and family. Jim and I occasionally took private time together in the room, exchanging thoughts and hugs, or just allowing ourselves quiet time. With that needed quiet time though, came the brutal reality that Chris would soon die. Believe it or not, we were sometimes able to forget that for just a moment while caught up in the hosting of this "get together" at the hospital. Jim and I spoke of such things as what Chris would be buried in, who would be his pall bearer's, what music we would play at his funeral, and who would say the service. It was odd, we discussed many of these things as if we were planning a birthday party or something, with apparent resigned calmness. 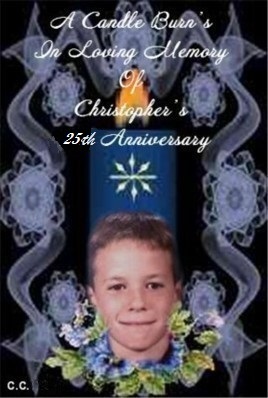 Darkness began to fall outside, and with that, Chris's time left here on this earth began to shorten. I so wanted my mom to be here with me, but I also knew that my mom's arrival would also bring about the death of my son. I was so torn. All of our friends and family remained there with us, supporting us as needed. The hospital staff continued to amaze me with their unfailing compassion for what we were going through. Some of the nurses who had taken care of Chris during the daytime elected to stay over past the end of their shifts, to see this through to the end. 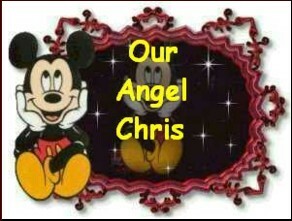 The nurses cried with us, the doctors cried off to the side, they were so touched with Chris's spirit. 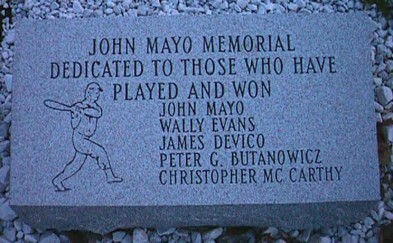 They could tell how special he was by the love that his friends and family had for him. There were times when I wished that time would stand still, thus allowing me to have Chris here with us forever, and then moments later I would find myself wishing that this nightmare could be over. 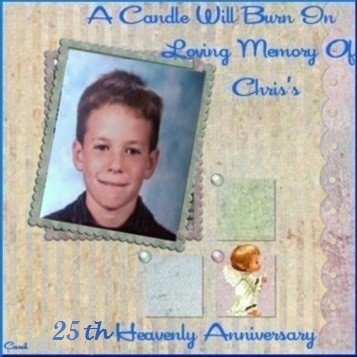 That we could kiss Chris goodbye and go about figuring out how we were going to live without him. 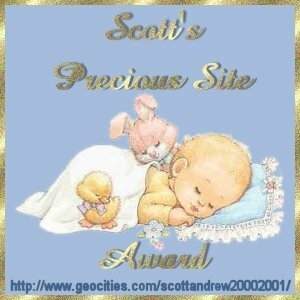 How we would cope with the loss of our precious son. Time passed, there was no holding that back. I watched the clock, I spent time sitting with Chris, holding his hand. Telling him of the great love that we all had for him. Telling him that he had indeed been strong, but that we knew that he must rest soon. I said my good-byes, through my tears. He was so peaceful. There was so much to say to him, and I knew that time would limit what we could say. 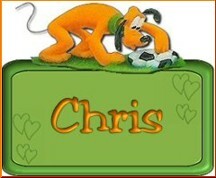 I knew that Chris had lived a wonderful life in his short time here on this earth. 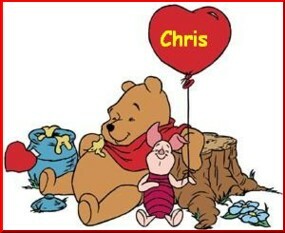 I never felt the need to assure Chris that he was indeed loved by all, I knew he knew that. 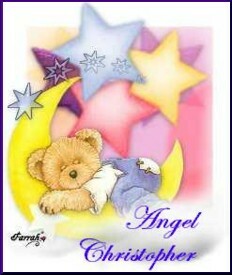 What I did need to let Chris know was that it was alright to close his eyes and peacefully leave us. That he didn't need to be frightened about what was ahead of him. And didn't need to feel as if he had let us down by leaving us. Jim and I had discussed how we would remove Chris from the ventilator. 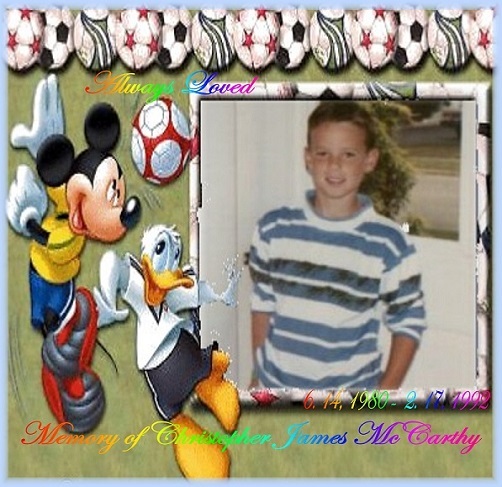 After my parents arrived we would allow them to visit Chris and when they were ready Jim and myself, along with my mom and dad and Jim's mom would have him removed from the ventilator, and remain with him as he passed from this earth. My parents arrived at about 10:45 PM. I collapsed in my mother's arms, feeling as if I was once again a child, basking in my mother's comforting embrace. I so wanted her to make this pain go away, the way only mothers can do. It was very difficult for my parents. 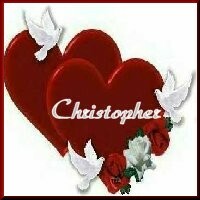 When they left South Carolina they did not know that Chris would die. 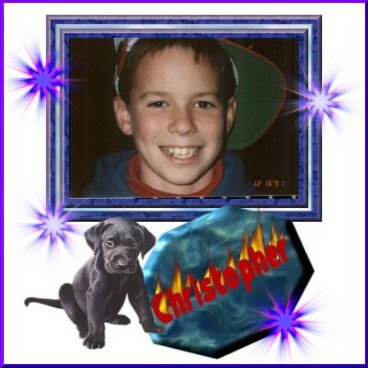 They flew to Connecticut with the hopes that Chris would overcome this horrible accident. So when they arrived they were not prepared for my grim news. It was all happening so fast. I explained to them that we were going to remove Chris from the ventilator and they were stunned. How could this all be happening to their daughter, to their grandson? I brought them in to see Chris. I know now how painful this had been for them. We all had the benefit of seeing this unfold, and they were just thrust into it. Chris's blood pressure continued to drop, we knew that within moments his heart could stop. There was a desperate need for me to have control of his passing. To this day I don't know why. 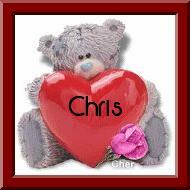 But I knew for sure that I wanted to hold Chris in my arms as he died. And so the time was here. We needed to let Chris go. We told the nurse that we were ready. They brought chairs to the bedside for us. My father, bless his soul, was attempting to console both his wife and daughter. A task no man should ever have to face in his life. Jim's mom was trying to be so strong for the two of us. 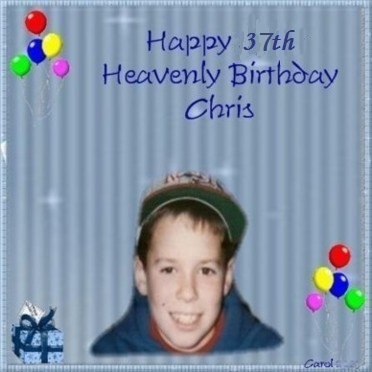 We never asked if they would all like to be there with us, when Chris was removed from the ventilator. That was probably not fair. I now think I know just how they must have felt at that moment. I truly believe that the worst pain that one can experience is the loss of a child, but the second worst pain must be, to be a parent of a child who loses a child. We as parents want to shield our children from any and all pain, and how it must have been for our parents to have to witness what we were going through. Maybe given a choice, they would have declined. Perhaps the sight of Jim and I as we helped Chris pass was more than we should have asked of them. Jim and I placed our chairs side by side. I believe that our parents stood behind us. The nurses worked quickly. They first removed the cervical collar that was around his neck. It was then that I noticed the only sign of Chris's accident. There was a small bruise, about 3 inches long, on the side of his neck. I remember thinking how odd, that was the only visible injury he had incurred. They removed Chris from the ventilator and pulled the tube that he had going into his lungs. They quickly placed Chris in our arms. He laid across Jim's and my lap as if he was sleeping. For a brief moment I prayed that he would take a breath, although I knew that was not possible, his brain was dead, and he would never take a breath again. I resolved myself to allowing him to die. The nurses turned the monitor at the bedside off, so that we would not have to be subjected to watching his heart stop. They stood off to the side weeping quietly. I have never been able to explain to anyone what I felt at the moment of his death. It was a profoundly peaceful moment, as he passed from one existence to another, I was overcome by a feeling of peacefulness. It was a feeling I have never had before, and think I will never have again. It is not really possible to put it to words. We sat for a moment holding Chris in our arms. We kissed him and expressed out love for him. I am not sure how long passed until we placed his body back into the bed. We left the ICU, and told all our friends and family that Chris had died. There were many tears and hugs. This horrible ordeal had come to an end, or so I thought. I could not have known what was ahead of us for years to follow. Our new life had just begun. Our life without Chris. didn't you, and for what I have read you were great too. I love your shirt, and your ball with your name on it, Way to go. in HEAVEN having a ball. 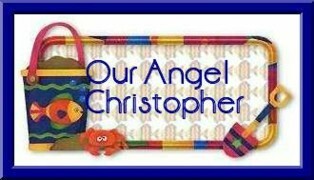 These two gifts above are for Christopher's mother and family from one grieving parent to another. May God bless and comfort you.